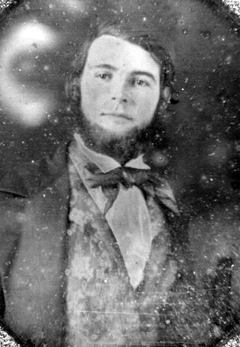 During the course of the war, probably in 1864 since Morgan's forces were active in Kentucky during this time, Lindsay Duke was captured and taken to a military prison in Louisville, Ky.
Rebel sympathizers living with five miles of any scene of outrage committed by armed men not recognized as public enemies by the rules and usages of war guerrillas will be liable to be arrested and sent beyond the limits of the United States. So much of the property of rebel sympathizers as may be necessary to indemnify the government or loyal citizens for losses incurred by the acts of such lawless men, will be seized and appropriated for this purpose. Whenever an unarmed Union citizen is murdered, four guerrillas will be selected from the prisoners in the hands of the military authorities, and publicly shot to death in the most convenient place near the scene of the outrage. On October 25, 1864, Burbridge's order was applied in the case of a death of a Federal soldier near Jeffersontown, Kentucky. The soldier had been killed by a guerrilla group led by Sue Mundy, a notoriously violent Confederate soldier who changed his name to avenge the brutal treatment of his foster brother who had been shot in the head by a Federal soldier and left for dead in the ditch. He recovered but with the loss of his eyes. His foster brother swore that he would never again take a Federal soldier alive. It has been a long time since I have written to you, but I have not forgotten you. I am under sentence of death and for what, I do not know. My sentence has not yet been made known. My dear sister I have always loved you and will in my dying breath. It is a hard thing to be chained and shot in this way; and if it was not for the hope I have of meeting you all in Heaven, I would be miserable indeed. I obtained forgiveness of my sins about two weeks ago on a steamboat while I was being brought to this city. Blessed be the name of our God; he is, indeed no respector of persons. All I can do now is to earnestly pray that the Lord for Jesus' sake will sustain me in death. O! my God! give me a happy admittance into Heaven. Sister, continue in the service of God. Show this to all my brothers: Stanton, John, Horace, and Charlie: and all my brothers in law, Polly and her children. Before this reaches you I will be no more on earth; but I feel that I will meet my friends in Heaven. O! dear sister, urge upon them the necessity of being christians. Tell Stanton and Charlie to stop sinning--to seek and serve the Lord Jesus, who is, and has always been our best friend. Our father, mother, brothers and sisters and step mother, some of your children, my own dear wife and children have all gone on before us; we have promised them all to meet them; promise me that you will meet me. Sister, you little know the influence you have over us all. You have been an angel of mercy to us when we were little helpless orphans. O! sister, eternity can only tell how much we love you. Our Savior will reward you; it will be but a little while until you will come to him, but do try and get all our brothers to obtain religion and get to instruct their children to serve the Lord. My great regret is that I have been such a sinner. I have been miserable generally through my life and am certain it has been mostly caused by my disobedience to God. I am sorry, very sorry indeed that such has been my course; if I could but live, I would endeavor to do all in my power to advance the causes of Christ. Give my best love to all my acquaintances and friends and tell them to come and meet us. I would like to see you all before I die; however we must trust in Jesus in whom we never put our trust in vain. Gen. Burbridge is buried in Arlington National Cemetery, whose website says, "His administration of Kentucky earned him the enmity of the duly constituted civil authorities as well as of the populace. Relieved from his command in January 1865, he resigned his commission in December.After the Civil War, he and family were socially and financially ostracized." 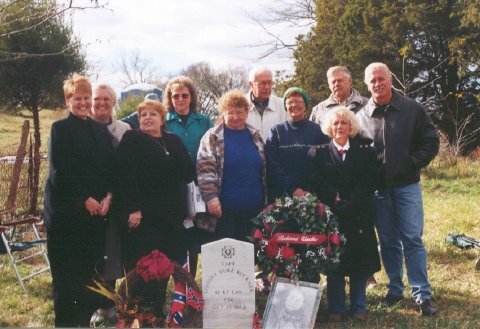 In 2001, a small band of Buckner descendents gathered at the gravesite of Lindsey Duke Buckner to remember him and to take part in a ceremony to dedicate a veteran's grave maker for him. Research to locate the gravesite and authorize the stone was done through the persistent efforts of historian Nancy Hitt. Shown above: Buckner relatives who attended a memorial service honoring Capt. Lindsey Duke Buckner, CSA, on October 27, 2001, near Greensburg, KY. The gathering was to dedicate a veteran's grave marker for Capt. Buckner, whose final resting place at the Edwards cemetery on Hwy.1464 was never had a marked stone. Back row: Susan Keltner Elmore, Lou Ellen Clark Arnett, Willard Clark, Bill Clark, John Buckner. Front: Molly Clark Daniel, Sharon Knight Long, Rose Buckner Noe, Ona Buckner Sidebottom, Ramona Rogers Murrell. These persons are descendents of either William Stanton Buckner or Charles Madison Buckner, brothers of Lindsey Duke Buckner. Also in attendance but not pictured were Sue Avery as well as Bernita Clark Rogers and Elsie Clark Jones (the latter two are granddaughters of Julia Levert Buckner Clark, niece to Capt. Buckner.) Other cousins may have left before the picture was taken. 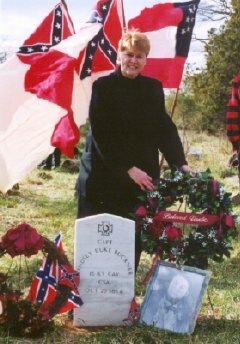 Molly, at the 2001 ceremony to dedicate a veteran's gravemaker for Capt. Lindsey Duke Buckner. 1. Richard Collins, "Civil War Annals of Kentucky (1861-1865)," The Filson Club History Quarterly, 35 (July 1961), p. 293. 2. According to notes on an article which appeared in volume 57, (October 1959) issue of The Register of the Kentucky Historical Society, Sue Mundy was actually Marcellus Jerome Clarke and enlisted a Private, Company B, Fourth Regiment Infantry, Kentucky Volunteers, C, S.A., August 25, 1861, at Camp Burnett, Montgomery County, Tennessee; he was captured at the battle of Fort Donelson (February 12-16, 1862) and sent to Camp Morton, Indiana, but very shortly after he escaped, returned to Kentucky and organized a guerrilla band and assumed the name of Sue Mundy. Clarke's father was Hector M. Clarke, born in Chesterfield Co,, Va. (1795) and resident of Simpson Co., Ky. He served as a Brigadier General in the Kentucky militia. The Register's article has more information concerning famous and notorious relatives of this branch of the Clarke family.